The Young and the Restless spoilers tease that Victor’s (Eric Braeden) name could be offered perennially for this dubious award. But that would be too easy for Y&R fans. 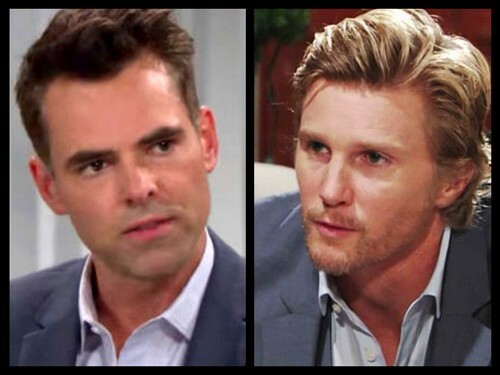 So let’s simply compare two contenders for this grouchy title in Genoa City. Vickie (Amelia Heinle) has once again revealed herself as a worthy namesake of the Moustache. Although this nomination is simple, as highlighting Victor’s daughter is basically like tagging the Black Knight for his many offenses against humanity. With the last year, Vickie sunk her company by allowing personal business to override day-to-day affairs. She blamed everyone under her thumb for being at fault, while she was sitting in the owner’s chair. Billy (Jason Thompson) did everything possible to regain his soul mate’s heart. 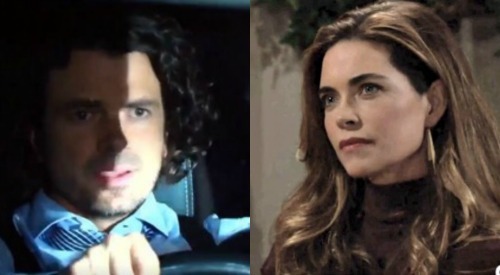 But the Ice Princess froze him out, pushed him back to Phyllis (Gina Tognoni) and then slapped his face after he’d just rescued three children from a fire at Nick’s (Joshua Morrow) nightclub. 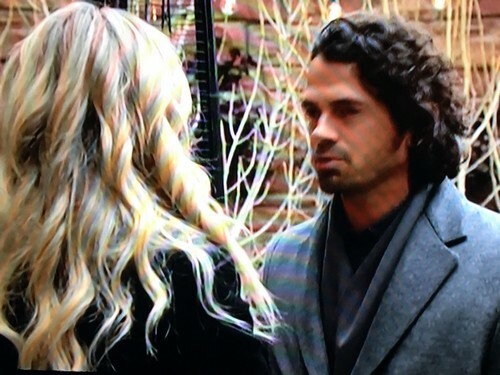 Weeks later Vickie wanted Abby (Melissa Ordway) to shoulder all blame for the chaos Zack (Ryan Ashton) created through Design Date. J.T. (Thad Luckinbill) better watch out. He’s just returned to town. Who knows what Vickie will do to him through the Christmas season, or in the New Year. Vying with Vickie for this title is Mr. Scott Grainger (Daniel Hall). Some may think that his moral crimes are less offensive. But that’s subjective, as will now be presented. Sharon (Sharon Case) welcomed this so-called paragon of virtue, who claims to be a world-renown journalist, into her heart and home. What does Scott do in response? He’s confined inside a storage locker and quickly goes horizontal with Abby (Melissa Ordway). That purposeful betrayal could have been justified as a response to a flashback. Scott’s backstory includes having been held hostage. However, Scott follow up that act by kissing Abby’s full lips at Chancellor Park, which was fully out in the open. Little did he know that Faith (Alyvia Alyn Lind) was watching and would soon tell Mariah (Camryn Grimes). Here’s this scribe who purports himself as a seeker of justice. Meanwhile, he’s involved with two women at one time. Hypocrites often claim to be the cleanest people on the planet. They tell others how to live because they are living wrong. Scott the lout. Scott the cheater. Scott the deceiver. Any moniker fits tightly around his shaggy-haired conscience, as Sharon will soon and sadly find out. Yes, there are other GC personas who could be mentioned as grinchy grinches. But purely considering Vickie and Scott, who would win out? CDL is a leading source for everything linked to The Young and the Restless. Check back regularly for Y&R spoilers and news! Who Deserves The 2017 Christmas Grinch Award – Victoria or Scott?